Each 100 mL contains: Florfenicol 10 g, excipients q.s.p. 100 mL. 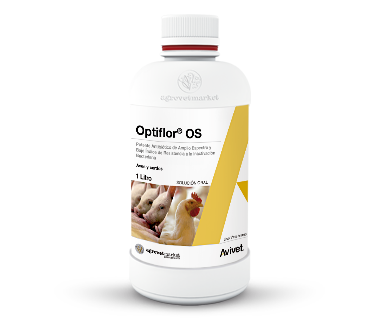 Optiflor® OS is a broad-spectrum antibiotic, developed from thiamphenicol, as an alternative to bacterial resistance and without side effects compared to chloramphenicol. It has a broader spectrum than chloramphenicol and is about 100 times more potent. It acts against gram-positive and gram-negative microorganisms, and even shows a spectrum superior to its analogue, thiamphenicol. Preventive and therapeutic treatment of infections due to Mannheimia haemolytica, Pasteurella multocida, Haemophilus spp., Streptococcus spp., Actinobacillus pleuroneumoniae, Bordetella bronchiséptica, Escherichia coli, Clostridium spp., Ornitobacterium rhinotracheale, Staphylococcus spp., Proteus spp., Enterobacter spp., Shigella spp., Klebsiella spp, Lawsonia intrecellularis and Salmonella choleraesuis among other bacteria susceptible to florfenicol. Poultry: Colibacillosis, pasteurellosis, saculitis and bacterial respiratory infections. Colisepticemia among other gastrointestinal diseases caused by susceptible germs. Swine: Porcine respiratory syndrome, pleuropneumonia, atrophic rhinitis; ileitis and gastrointestinal infections caused by susceptible germs. Poultry: 20 mg/Kg for 3-5 days, in practice 1L/1000 L water (100 mg/L). Swine: 10-20 mg/Kg for 5 days, in practice 1L-2L/1000 L water (100-200 mg/L).